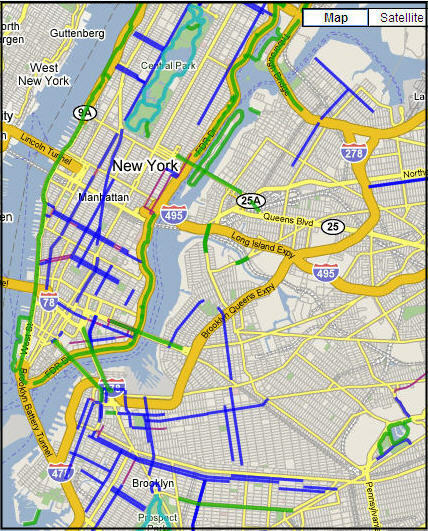 NYC Bike Maps .com is your online resource for bicycling in New York City. Our goal is to provide you with accurate maps, relevant information, and up to date news to facilitate a safe and enjoyable biking experience in the New York metro area. A color coded legend is used to identify the various components of New York City’s bicycle network. More information about the bike paths, bike lanes, bike routes, greenways, and parks in New York City’s bicycle network can be found in the NYC Bike Map Legend. TAKE IT WITH YOU: The Free Official New York City bike map from the NYC Dept. of City Planning and the Dept. of Transportation Bicycling Program. CONTRIBUTE: Please report map errors.Tag your pictures on flickr, links on del.icio.us, and videos on youtube with “nycbikemaps	“.